The information in this early article is updated in my article at "Is Dreamfields Pasta Good for People with Diabetes?" They know a thing or two about pasta in Italy. And now an Italian company is poised to enter the American market with pasta for people with diabetes. The company presented their FiberPasta to the U.S. at this June's scientific sessions of the American Diabetes Association in Chicago. While I was at that huge convention, I wasn't able to connect with them. However, they were aware of my three articles about Dreamfields Pasta, including my most recent one here in September. Consequently, Fabiana Molinelli of the company's export department, arranged for their importer to send me a case each of their spaghetti and of their fusilli, which is similar in shape to rotini. FiberPasta also comes in the form of penne and sedani. All four pastas have the same nutritional content. FiberPasta has 8 grams of fiber per 2 ounce serving. Dreamfields has 5 grams. But then it gets complicated. A 2 ounce serving of FiberPasta has 33 grams of net carbs (starches and sugars less fiber) and a total of 180 calories. That's 20 percent fewer calories than regular pasta, Fabiana says, because it contains 2 percent inulin fiber and 4.5 percent resistant starch, which help slow the absorption of carbohydrates. A 2 ounce serving of Dreamfields Pasta, on the other hand, has just 5 grams of net carbs per serving and an actual total of 130 calories (in spite of what it says on the "Nutrition Facts" label). The big difference is the process by which almost all of the carb grams in Dreamfields are "protected" and therefore not digestible. These statistics aside, the proof is in the eating. This means for those of us with diabetes both the taste and the blood glucose effects. 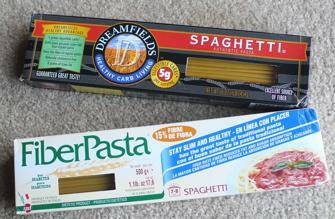 I have been eating Dreamfields Pasta for years and can't tell a taste difference between it and regular pasta. FiberPasta tastes just about as good, although I detected what seemed to me a slight pasty texture in my initial taste test yesterday afternoon. I compared that with Dreamfields, which I had for lunch today. I replicated the two meals as closely as possible by going for an hour-long walk before each meal and eating nothing else for several hours. For each meal I served myself a double portion of 4 ounces of pasta as measured on my scale. I served it in the simple and tasty way that I prefer, using nothing but a light coating of olive oil, 2 cloves of garlic, a little crushed red pepper and salt, and topped with 3 tablespoons of grated Parmesan cheese. Each dish was so good that it makes me hungry just to write about it now! While FiberPasta had little effect on my blood glucose, it couldn't compare with Dreamfields. Comparing my blood glucose level just before each meal with my result exactly 2 hours after the first bite of each was the key. With FiberPasta my level rose a modest 33 points. But my level two hours after starting my Dreamfields meal actually dropped 13 points. I am certainly not claiming that your blood glucose level - or even mine - will go down because of eating Dreamfields Pasta. Some people who have high levels of insulin resistance will notice a big increase in their blood glucose after eating Dreamfields. But levels can drop just because of the passage of time. So Dreamfields satisfactorily met the FiberPasta challenge. Still, FiberPasta will be a good alternative for us when it arrives on our supermarket shelves in a month or so. It is, as Fabiana says, "a source of fiber disguised as pasta. " We'll be able to increase our fiber intake while simultaneously enjoying a tasty dish.